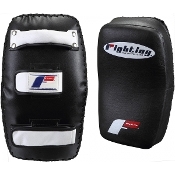 Contoured wider design allows unlimited striking and kicking options. Constructed with a select full grain leather shell with more than 4" of a trio of Fighting foams - sponge, high and low density - that invite every offensive weapon in your arsenal ... and more. Quadruple reinforced and riveted back handle bar with twin wrist and forearm hook-and-loop closures for a firm, secure, no-slip training session every time. Durable nylon dura-cord stitching ensures years of security.